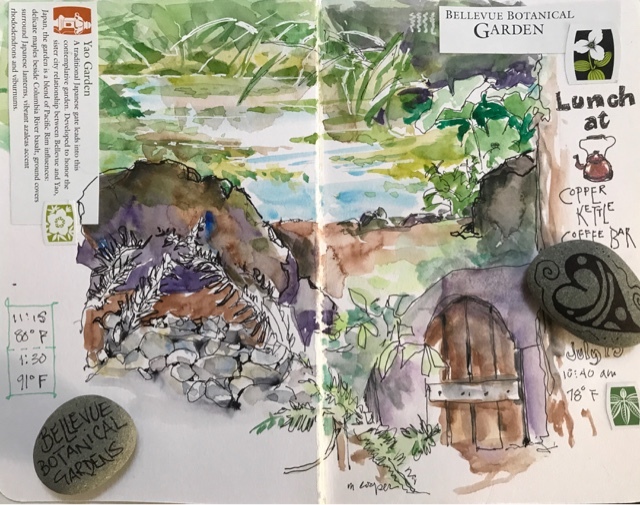 As our heat wave continued, USk Seattle found refuge at Bellevue Botanical Garden for their monthly outing today. It was cool and comfortable in the shade of the forested garden. The outside temperature climbed from 78°F to 91°F from the time we met at 10 am. until many left the parking lot after lunch at around 2:00 pm. I was amazed at the transformation from the old familiar gardens that I last visited at least a decade ago. New buildings, teaching centers, pathways and further development of emerging sections of the garden were everywhere in evidence. I went looking for something familiar. First, I found the "Hobbit Door" as I walked along the path beyond the Tea House. Although I was on my way to the Yao Garden, I just had to capture this enchanting little feature. I was entranced as always by the serenity of the Yao Japanese Garden. I found a cool shady spot at the south end of the pond and spent the rest of my sketching time there. I sketched the summer sky reflected in the pond and the rocks and plantings bordering it all around. Somehow I was subliminally influenced to go to the gift shop and buy two rocks with images on one side and sayings on the other. They make good paper weights! 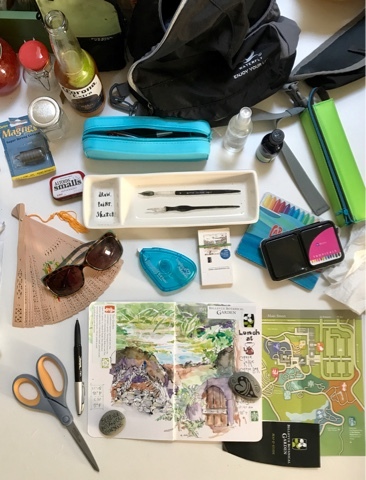 I dumped out my sketch bag on the studio table and used the garden map for a bit of ephemera on my journal page. With the air conditioning on full blast, I made the 1 hour commute back home where the gauge on the deck said it was 92°F in Marysville! Isn't this supposed to be the weather in Porto during the symposium? I think we've switched climates!